Leaving the improvised race courses of the Honda Indy Toronto and the Edmonton Indy, the 2011 IZOD INDYCAR Series arrives at only their second permanent road course for the season. Consisting of challenging turns and high speed stretches, the 49 year old Mid-Ohio Sports Car Course welcomed 27 competitors from North America's top open wheel racing series for the Honda Indy 200 race on Sunday. During Saturday's qualifying for the Mid-Ohio 85-lap event, The Chip Ganassi Racing cars demonstrated the strength shown in practice as the lowest starting driver will be rookie Charlie Kimball in 10th place. Entering into the Firestone Fast Six for the Honda Indy 200 at Mid-Ohio Sports Car Course, 3 of the 6 runners in contention sported Ganassi ownership. Ryan Briscoe, Scott Dixon, Dario Franchitti, Ryan Hunter-Reay, Will Power and Graham Rahal made up the top-6 drivers granted the final 10-minute session. Able back up his speed on Friday, Graham Rahal posted a 6th quickest result in Mid-Ohio qualifying. Rahal will be starting in the outside third row with the Saturday morning practice's fastest Andretti Autosport car piloted by Ryan Hunter-Reay. In the second row, the main IZOD INDYCAR Series title fight is paired together with Dario Franchitti finding just short of 2/100th of a second advantage over Will Power. Expect the #10 Target Chip Ganassi Racing and #12 Verizon Penske Racing cars to crave a great separation after the end of 85 laps of Mid-Ohio competition Sunday. 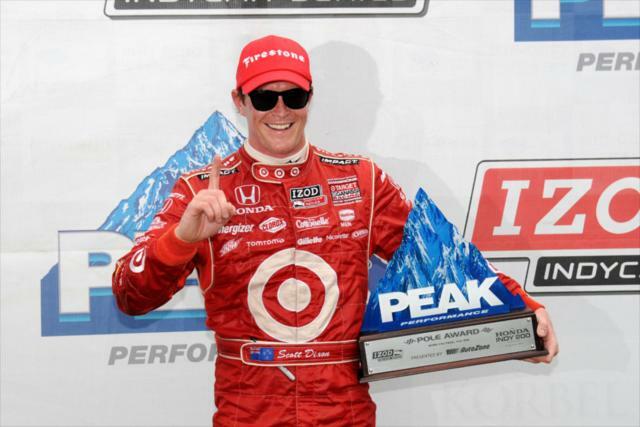 Taking pole for the first time in his 2011 IZOD INDYCAR Series season is New Zealand's Scott Dixon. Lapping the Mid-Ohio Sports Car Course in 1 minute, 8.0776 second to take top spot, the #9 Target car took a rather sizable 25/100th of a second advantage over the #6 Penske Racing car of Ryan Briscoe. Seeking his first victory this year after four runner-up finishes, Dixon possesses some favourable history at the Mid-Ohio Sports Car Course in IZOD INDYCAR Series racing. Scott Dixon has won the 2007 and 2009 winner at the 2.258-mile road course. Other notable qualifying results during the Saturday afternoon session is the all-Canadian 4th row for the Honda Indy 200 at Mid-Ohio. Starting 7th place is the #06 Newman/Haas Racing car of James Hinchcliffe and the #77 Sam Schmidt Motorsports car driven by Alex Tagliani seated in 8th place. Also collecting good starting positions for Sunday's IZOD INDYCAR event is Sebastian Bourdais in 11th and Simona de Silvestro in 14th place. Deep down the grid after struggling to find speed all weekend is three of the four Andretti Autosport cars. Mike Conway will start 17th while the #26 of Marco Andretti collected an 18th grid position. The slowest car of the Andretti Autosport stable at Mid-Ohio has proven to be the #7 of Danica Patrick. Patrick will start 23rd of the 27 cars competing in the Honda Indy 200 Sunday. After posting some impressive speed on day one, Justin Wilson and the #22 Dreyer & Reinbold Racing team faced a challenging Saturday following a crash in practice. A car that was 5th fastest in Friday practice, the #22 car was handled by transitioning sports car driver Simon Pagenaud in substitution for Wilson in qualifying. Word after qualifying from Dreyer & Reinbold Racing his Pagenaud remaining in the in car for the Mid-Ohio Honda Indy 200 race on Sunday as Wilson will sit out for the event. The IZOD INDYCAR Series Honda Indy 200 at Mid-Ohio will start at 2:50 PM on Sunday.